« A Better World for US! How rich people make MONEY? I’m going to start our journey to create a better world for US! by teaching you about MONEY. Why I’m going to start with the MONEY topic? Well, our society is based on MONEY and MONEY is the topic that worries us most. What is MONEY? I’m not covering what is MONEY today. Why? It does not a matter what MONEY is; what it matter is that in our society and in our time we need MONEY. In the future, I promise that I will use a blog page talking about what MONEY is; although today we are going to talk about how we make MONEY. I learned this from Robert Kiyosaki and this is one of the best lessons I had learn about money. Robert Kiyosaki in the book he wrote with Sharon L. Lechter, Rich Dad, Poor Dad he express how rich people create MONEY. He explains in his book about how to create advocates financial independence through investing, real estate, owning businesses, and the use of finance protection tactics. Rich Dad, Poor Dad is written in an anecdotal manner and is aimed at creating public interest in finance. Kiyosaki and Lechter stress the advocacy of owning the system or means of production, rather than being an employee. The first step in order to get a financial independence is to get this book and understand what is about. I do not want excuses; so I have created a link from where you can get this book. Click here and get it now! Rich Dad, Poor Dad. This book will teach you the basics about how rich people make money. 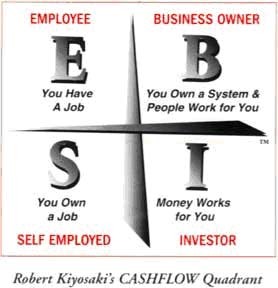 Another book written by Robert Kiyosaki and Sharon L. Lechter is “Cash Flow Quadrant”. Kiyosaki in this book speaks often of what he calls “The Cashflow Quadrant,” a conceptual tool that aims to describe how all the money in the world is earned. Depicted in a diagram, this concept entails four groupings, split with two lines (one vertical and one horizontal). In each of the four groups there is a letter representing a way in which an individual may earn income. The letters are as follows. E: Employee — Working for someone else. S: Self-employed or Small business owner — where a person owns his own job and is his own boss. B: Business owner — where a person owns a “system” of making money, rather than a job to make money. I: Investor — spending money in order to receive a larger payout in. Get these two books now, read it and send me all the questions you have. This entry was posted on Monday, January 12th, 2009 at 6:03 pm	and is filed under Money. You can follow any responses to this entry through the RSS 2.0 feed. You can leave a response, or trackback from your own site.